Software process management has been proven a useful means to help software organizations improve their development processes and produce high quality products. It focuses on providing process-related products and services to software developer. Chinese software industry is developing rapidly. Effective software process methods, technology and tools that help them produce quality products while reducing the costs are in desperate need. 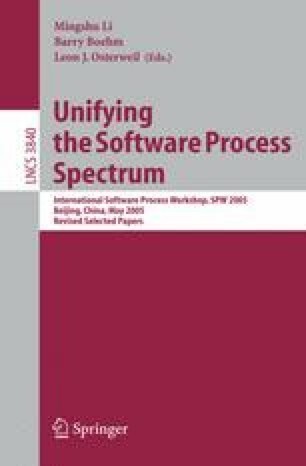 This paper discusses the current state of project management in Chinese software companies and presents a solution and practices meeting this need. Supported by the National Natural Science Foundation of China under grant Nos. 60473060, 60273026 as well as the Hi-Tech Research and Development Program (863 Program) of China under grant Nos. 2004AA112080, 2005AA113140.